Michigan once traded turkeys to Canada to replenish moose population in U.P. Stateside's conversation with Rachel Clark of the Michigan History Center and Steve Schmitt, a retired DNR wildlife veterinarian. Before Europeans arrived in Michigan, “moose were pretty much all over” the state, said Rachel Clark of the Michigan History Center. After that arrival, the moose population declined as settlers began over-hunting the animal and damaging its habitat. The moose population in the western Upper Peninsula appears to be rebounding after taking a dip a few years ago. 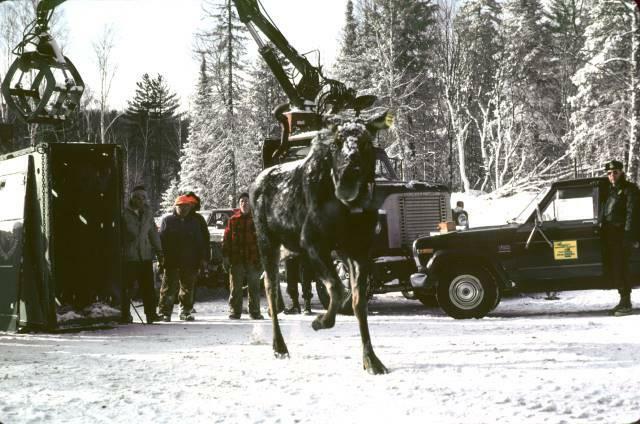 Moose were reintroduced into the western U.P. in the 1980s. Their range there covers about 1,400 square miles in parts of Marquette, Baraga, and Iron Counties. The moose population in the area grew to 451 in 2013 before dropping down to 285 in 2015. But Michigan Department of Natural Resources spokesman John Pepin says the just completed aerial survey counted 378 moose. The Isle Royale Wolf-Moose Project has been tracking the rare ecosystem on Isle Royale for almost 60 years. What makes Isle Royale rare is that the island, located in Lake Superior roughly 50 miles from the Upper Peninsula, has just two main animals inhabiting it. The food chain is simple: The wolves are the predators and the moose are the prey. Recently, the tracking of the wolves and moose on Isle Royale led to an unlikely musical creation. 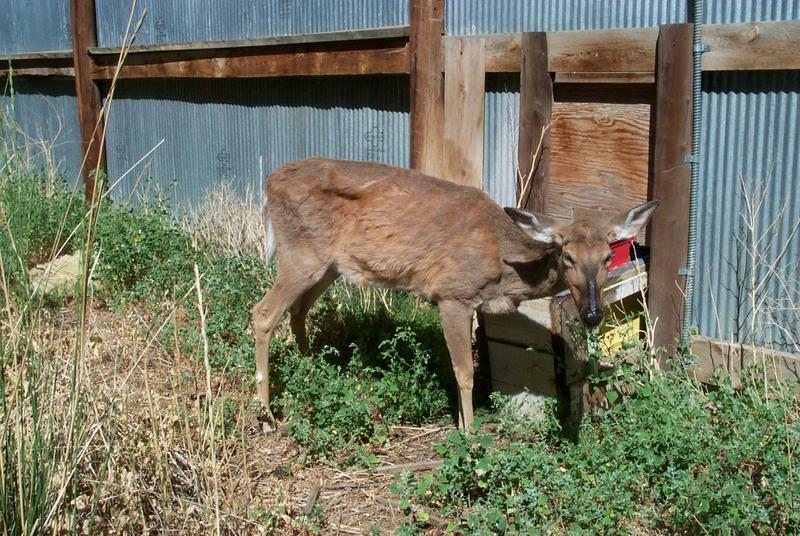 Last week, state officials confirmed they found chronic wasting disease in a wild deer for the first time. Michigan now joins 22 states and two Canadian provinces where the disease has been found. A serious health threat to the state’s wild deer population has been detected in mid-Michigan. A six-year-old doe found in Haslett last month has tested positive for chronic wasting disease. The neurological disease is always fatal. The disease is transmitted through saliva and other bodily fluids. The disease is fatal to deer, elk and moose. State lawmakers are taking aim at elk and moose poachers in Michigan. Lawmakers are considering tripling the fine poachers pay if they are caught illegally killing elk or moose in Michigan. Fines will also rise for bear and eagles. The ongoing study of wolves and moose on Isle Royale in Lake Superior has hit a critical juncture. Researchers in charge of the longest continuous study of a predator-prey system anywhere in the world released their annual report today. Why are moose populations declining? All across North America, something is happening to the moose. From British Columbia to New Hampshire, moose populations are thinning out, and no one has been able to point to a good, clear reason why. 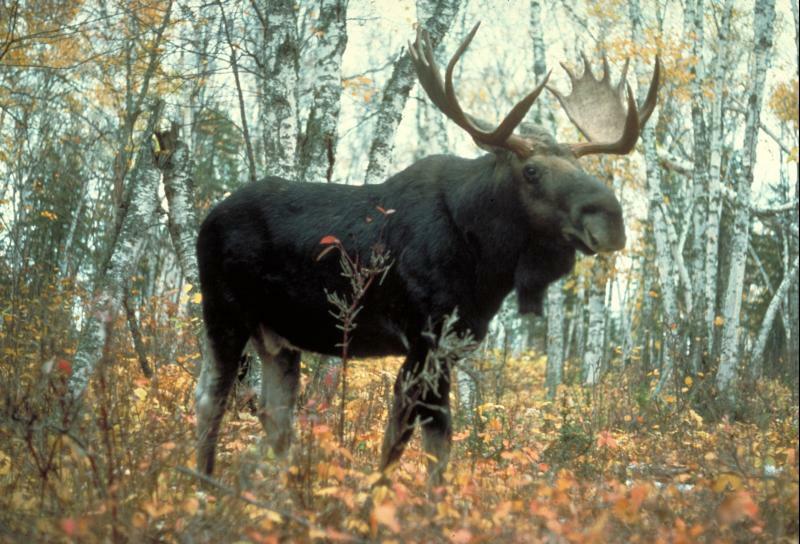 For the status of moose here in Michigan, we turned to Rolf Peterson, Professor at Michigan Technological University. He joined us from Houghton. MARQUETTE, Mich. (AP) - Poor weather is making it hard for the Michigan Department of Natural Resources to count the number of moose in the Upper Peninsula. The DNR surveys the moose population every two years. 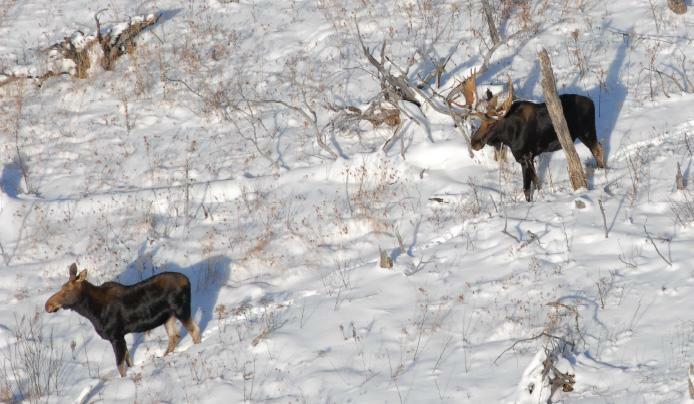 The census is based on the number of animals spotted by crews flying over prime moose range in Baraga, Iron and Marquette counties. 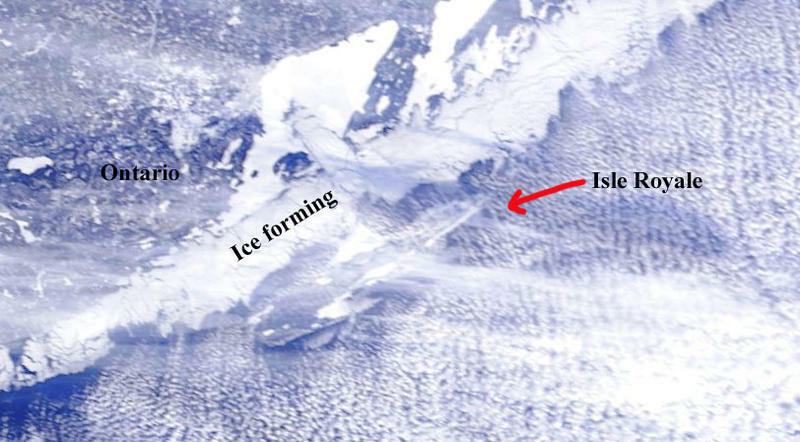 It's typically done in January, when the ground is covered with snow. That makes it easier to see the animals. Moose hunt opposed by Chippewa tribe in the U.P. 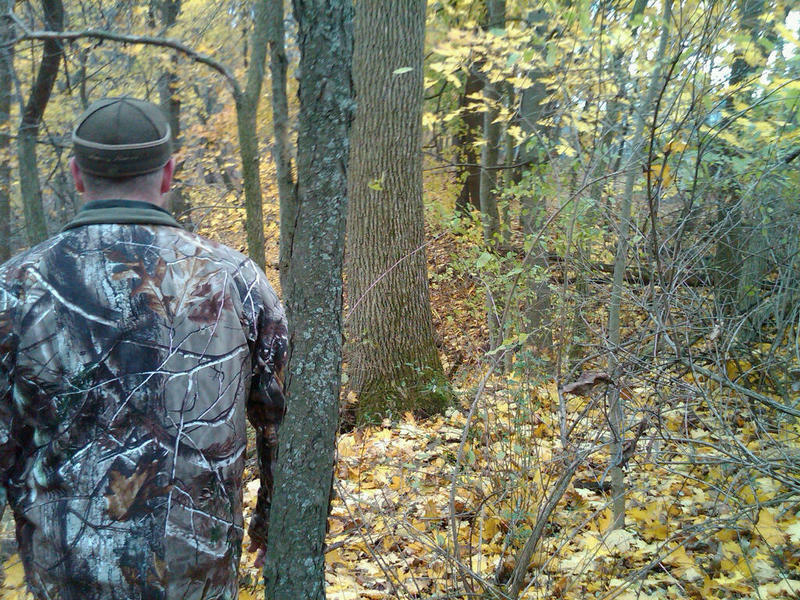 It's up to the Michigan State legislature to determine what game is available for hunting in Michigan. In late 2010, the legislature opened up the possibility of a moose hunt in Michigan. They charged the Moose Hunting Advisory Council with developing recommendations on whether or not a moose hunt should be conducted. (You can let them know what you think by dropping them a line - moosecomments@michigan.gov). The council is expected to present their report to the Michigan DNR's Natural Resources Commission next Thursday (September 15). The Associated Press reports that the Moose Hunting Advisory Council will recommend a moose hunt of 10 bull moose. The NRC will take the recommendation and decide whether a hunt will occur. But ahead of all that, the Inland Conservation Committee with the Sault Ste. Marie Tribe of Chippewa Indians voted to oppose the hunt. At its Aug. 1 meeting, the committee cited biological concerns of a hunt’s impact on a fragile and uncertain population of 433 moose. The proposed hunt would take 10 bull moose in the fall after the rutting season, according to news accounts. The Department of Natural Resources was officially notified of the decision last week. The statement says "under the terms of the 2007 Inland Consent Decree, the committee's opposition effectively ends Michigan’s bid for a moose hunt, for now." A spokeswoman for the DNR said the tribe's position will have no effect on the report going to the Natural Resources Commission next week. If the NRC votes to establish a moose hunt in Michigan, the question of whether or not the tribe's opposition prohibits a hunt will have to be answered. Isle Royale's wolves to go extinct? 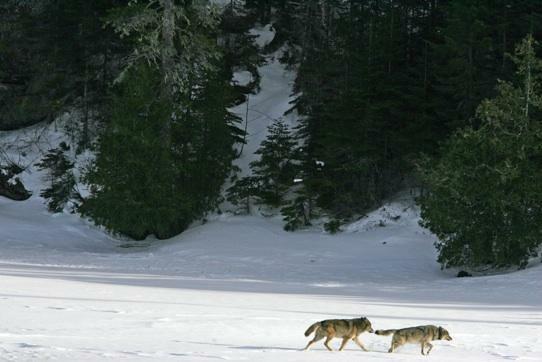 The wolves of Isle Royale National Park in Lake Superior could be in trouble. For 53 years, researchers from Michigan Tech have been studying the island’s wolf and moose populations. This year... they found there are fewer wolves – just 16. And only a couple of females that can still have babies. 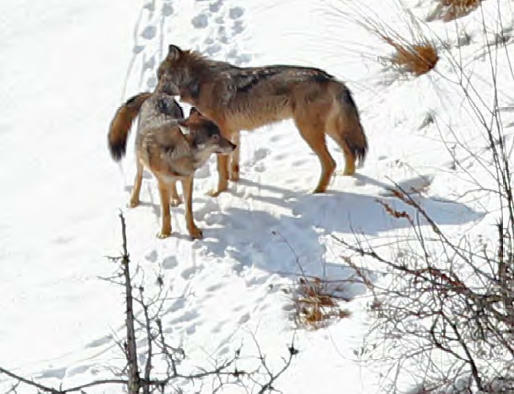 Rolf Peterson has been studying the wolves for more than four decades. He says it's not clear why some of the wolves are dying. "In late 2009, six of the ten females we had in the population died. That was just an unusual, presumably a fluke. Only one of the females was radio collared and she died in a very unusual way, she died giving birth." He says the outlook for the existence of wolves on Isle Royale is uncertain. "It could be just a little hurdle they have to jump through. It also could mean the beginning of the end if those one or two females should die without giving birth to a female. And if neither of the two pups we thought we saw this year are female, then that's it. The population would go extinct because there are no females." At this point, he doesn't think people should intervene. But he says there could come a point where the National Park Service might introduce new female wolves from the mainland. Peterson says the males on the island would readily accept new females if the existing females die. The wolves keep the island's moose in check. The research team has found that the moose population is currently around 500 animals. If the wolves go extinct, Peterson says the moose would be in trouble too. "They'd increase to the point where they'd starve to death catastrophically." Peterson has spent most of every year for four decades living among the wolves and moose on the island with his wife Candy. But he says there's still plenty to be discovered. "Almost everything that happens there surprises me. We're almost unable to predict the short term future. I guess the resiliency of wolves in general does usually surprise me. I wouldn't be the least bit surprised if they pulled out of this one. But exactly how they're going to do it is what's fascinating." You can learn more about the research team and the wildlife here.